Sponsored by Seoul Metropolitan City and Korea Tourism Organization, Seoul Christmas Festival is taking place at Cheonggye Plaza, the center of Cheonggyecheon Stream. Visitors can enjoy fancy illuminations, a Christmas tree and photo zones. Various events and programs are also prepared for a heartwarming end-of-the-year experience for everybody. A New Year’s Eve music performance and New Year’s Countdown will take place to commemorate the new year. The event lasts until Tuesday. For more information, visit www.seoulcf.com (Korean only) or call the travel hotline at 1330 for information in Korean, English, Japanese or Chinese. 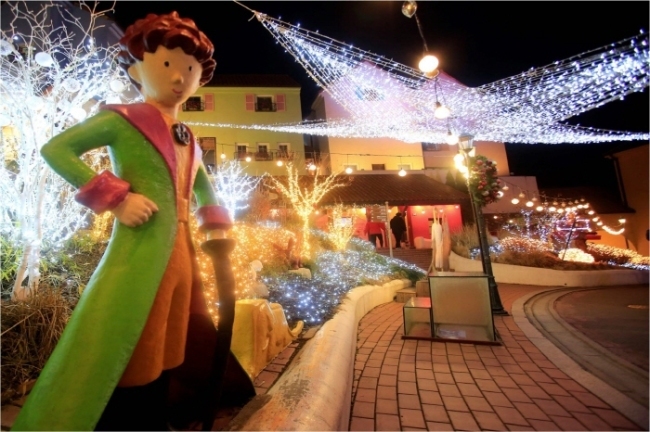 The Little Prince Lighting Festival of Petite France in Gapyeong, Gyeonggi Province, is being held throughout the Petite France Park, with illuminations at nighttime. Buildings, streets and Christmas trees have been decorated. There are also events such as puppet performances, magic performances and plaster art experiences. Operating hours are from 9 a.m. to 8 p.m., and admission fees are 8,000 won for adults, 6,000 won for middle and high school students and 5,000 won for children. The event is open from Dec. 1 to Feb. 28. For more information in Korean, English or Chinese, visit www.pfcamp.com. 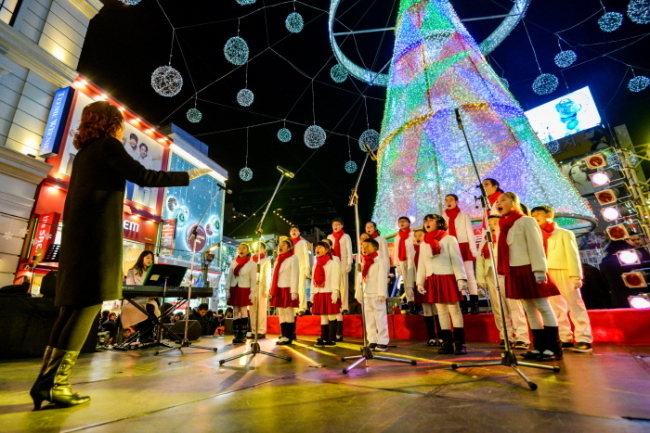 The Busan Christmas Tree Festival, Busan’s annual winter event, is being held in the Gwangbok-ro area of the Jung-gu District in Busan. There are concerts, a tree of wishes, street performances, a photo and video contest, and many more events and activities. The festival is open to visitors of all ages, free of charge. Call the travel hotline at 1330 for information in Korean, English, Japanese or Chinese. The homepage (bctf.kr) provides information in Korean only. 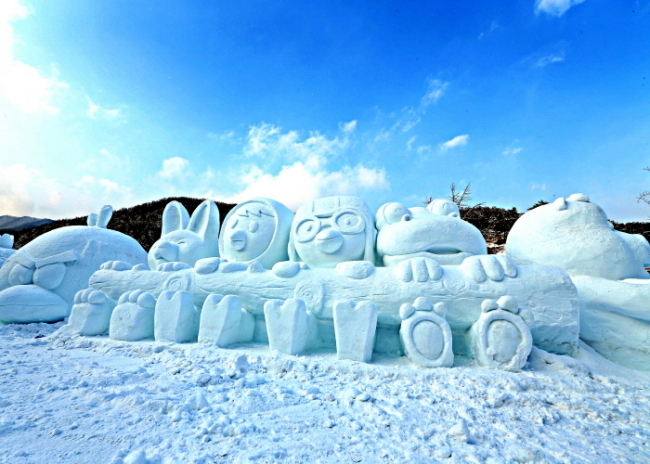 Chilgapsan Ice Fountain Festival in South Chungcheong Province features a large-scale ice fountain creating an Alps Castle where fairy tale characters live. The event is held from Dec. 23 to Feb. 18. Visiting hours are from 9 a.m. to 5 p.m. for daytime and 6 p.m. to 10 p.m. for nighttime admissions. For more information, call the travel hotline at 1330 for Korean, English, Japanese and Chinese services. 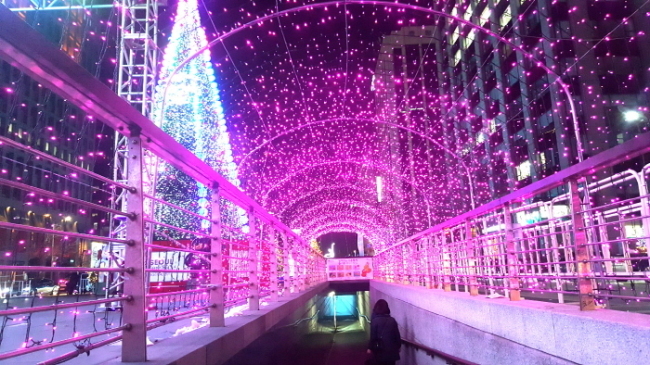 E-World Starlight Festival is being held with 10 million lights in E-World and 83 Tower in Daegu. Hot air balloons, roses, light decorations and other events will catch people’s eyes at this carnival-like festival. 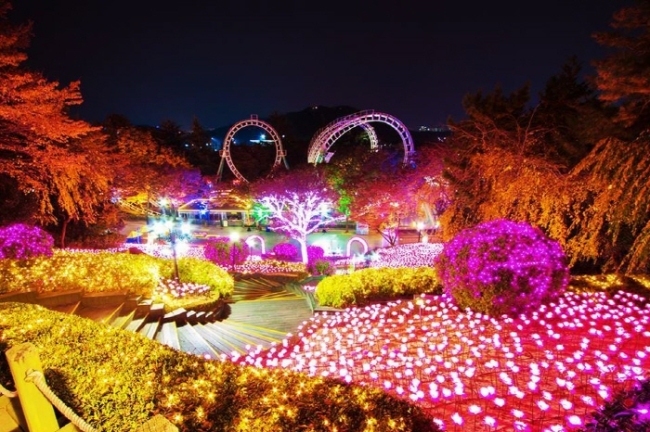 The events start at night and large trees are decorated along the 200-meter Light Road, as well as an Umbrella Road, Carnival Road, and photo zone created by 1,000 lights. The festival continues until Feb. 28. It is held from 5 p.m. to 9 p.m. from Monday through Thursday, and 5 p.m. to 10 p.m. from Friday through Sunday. It is open to visitors aged 5 or older. Call the travel hotline at 1330 for information in Korean, English, Japanese or Chinese.